on the woodside. : *crowd pleaser. I know it's been awfully flush with Asian flavors around the Woodside lately, but I found myself this weekend confronted with feeding a crowd—seven adults, two almost adults, and one toddler—including two pescetarians. Immediately I thought of two things: shrimp, and big bowl o' noodles. There are some spaghetti-haters in the group, so Italian was out. And because so many Asian flavors (fish sauce, sesame oil, chili sauce) are best in small doses, I tend to have a bottomless supply of them at the ready. I adapted this recipe from one at My Adventures in Food, because it's simple and easy and requires ingredients I can find at my wacky neighborhood grocer. It does not, however, carry pad Thai noodles (I substituted lo mein) nor, on this day, peeled and deveined shrimp (I did the dirty work myself, GOLD STARS). When I'm serving carnivores I use ground meat—chicken, turkey, or pork—which cuts the prep time down considerably. In this case I also cut each shrimp into about three pieces, the better to help things stretch a bit and feed a lot. I love the intensity of these flavors and the unexpectedly delicious, surprising weirdness of shrimp + eggs + peanuts. I doubled the recipe, but that's a lot for one pot to handle; I had to make two separate batches. Truth be told, I usually do—this one disappears fast, and the leftovers are divine. There are lots of ways to mix up the ingredients here—add more sriracha for heat, change up the meat, even leave out it out altogether—because it's basically a stir fry, but don't neglect the lime! It makes all the difference. 1. Cook noodles according to package directions. Set aside. 2. Mix fish sauce and next 3 ingredients in a bowl, stirring until sugar dissolves. Set aside. 3. Heat a wok or large, deep skillet over medium-high heat; add 2 tablespoons oil. Sauté garlic and sriracha until golden, about 1 minute. (Stand back; sriracha may splatter.) Add reserved noodles, tossing to coat with oil. 4. Push noodles to one side of pan, and add remaining 2 tablespoons oil. Crack eggs into pan, and cook until slightly set. Stir into noodles, breaking up eggs with a spoon. 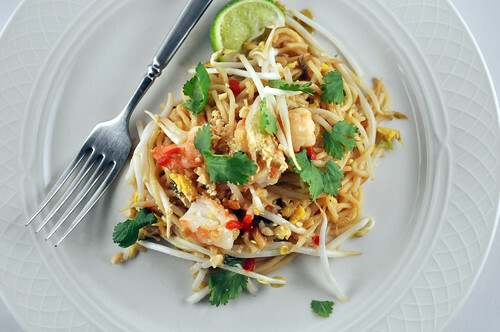 Toss in shrimp, green onions, most of the bean sprouts, and ½ cup peanuts. Cook 1 to 2 minutes or until shrimp just turn pink. 5. Stir in reserved fish sauce mixture, tossing to coat. 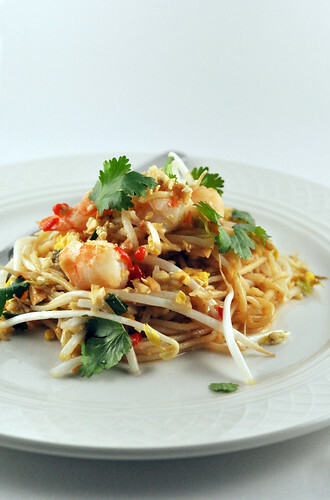 Sprinkle with cilantro, remaining ¼ cup peanuts, and remaining bean sprouts. Serve with lime wedges. Makes 4 servings.